An elephant in the sky? A peacock in the sea? Are creatures hiding where they shouldn't be? Lift the large flaps, follow the romping rhyme, and find each face that's out of place. Graphic artist Craig Shuttlewood whisks kids from desert to forest to ocean deep—and finally to the zoo, where the only one who doesn't fit is YOU! 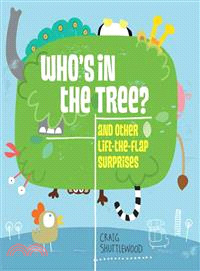 His outstanding debut introduces the idea of where animals (and humans) live-and will delight kids over and over again. Craig Shuttlewood is an author and illustrator whose quirky images and animations have been used in advertising, design, and publishing. His clients have included Orion Children's Books, Sainsbury's magazine, and Getty Images, and his art has been exhibited in galleries from London to New York. Craig lives in Brighton, England, with his partner and their daughter. This is his first book.